History-rich Greece bathes in the sunshine and the blue Mediterranean which means one thing: great food! Here, 10 traditional foods to try on your Greek adventure. The most famous cheese that Greece produces, feta, can be made from sheep or a combination of sheep and goat’s milk. It is brined into a curd that gives it its grainy, crumbly texture and salty aftertaste. Often served in salads or alongside meat and vegetables, it is delicious when grilled and, being lower in fat than most cows’ milk cheeses, a relatively healthy option. 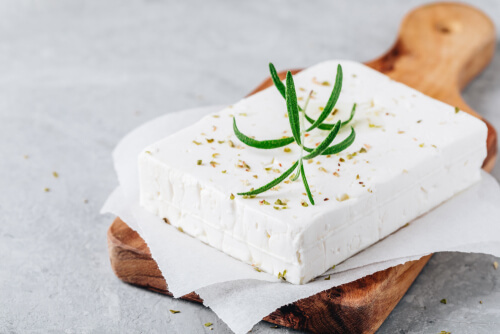 Protected as a designation of origin product, feta can only be made in Greece – and the locals make sure they keep the good stuff. A signature Greek entree, moussaka is said to have worked its way onto the menu in Greece when Arabs brought aubergines to the country. The classic version bakes them in olive oil to form its bottom layer, before adding minced lamb meat, tomatoes and herbs. The final, top layer consists of a béchamel sauce that gives it its golden-brown topping. As with any classic dish, variations have sprung up over time to include different vegetables, meat-free and even dairy-free options. However, if you see moussaka on the menu in Greece there’s a good chance it’s the version that has been a staple for nearly 100 years. Holidaymakers with a sweet tooth are in for a treat when it’s time to order dessert in Greece. Baklava is a legacy of the Ottoman Empire that stretched across southern Europe and the Middle East. The Greek version typically features a sprinkling of sesame seeds on top of layers of flaky pastry dough and is bound with Greek honey and stuffed with chopped nuts for flavour and texture. Greeks were said to be the group who perfected its thin, textured filo pastry dough – from the Greek, fýllo translates to leaf. 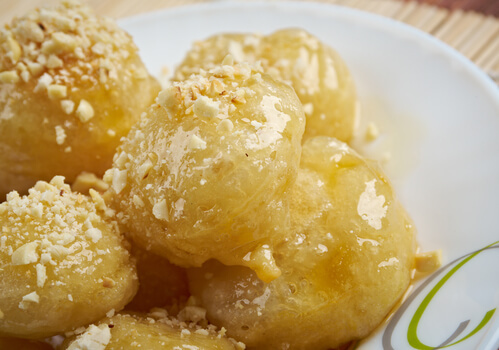 Another Greek dessert bound to get your taste buds engaged is loukoumades – Greek-style doughnuts. Fried for added flavour and decadence, they also make the most of Greece’s premium honey and flaunt a bright yellow sheen. Versatile enough to be enjoyed on their own or alongside chocolate, other fruits and syrups, loukoumades are the perfect holiday treat and can be shared with your fellow diners if you’re feeling generous (or just too full to finish). Wash them down with some strong and finely ground Greek coffee. Let’s start with a starter: the most famous olives grown in Greece are undoubtedly the Kalamata. These shiny black pearls share their name with the city in southern Greece from which they come. Green Conservolia olives are another favourite. Peppers, garlic, lemon and herbs are all frequently used to stuff Greek olives and add flavour and texture before the olives are stored in either oil or vinegar. Olive oil is a Greek institution in its own right. Used for cooking or as an accompaniment, olive oil traces its history to ancient Greek culture where it was used to maintain health and grooming. 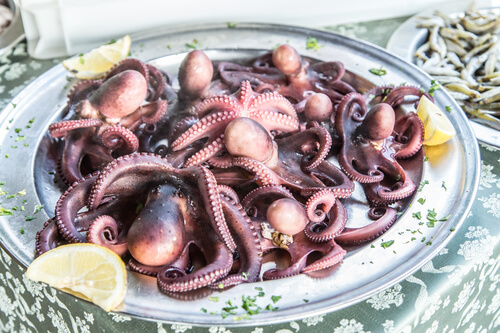 Octopus is another local produce that the Greeks’ have turned into a delicacy of their own. Most commonly grilled or braised in wine, oil or vinegar, oktapodi manages to be exotic yet simple. The preparation of the octopus itself is often tricky and time-consuming and chefs have to ensure it doesn’t become too tough or, break apart. Bite-size treats can also be found in the form of baby octopi that are pickled with herbs and spices then doused in lemon. The famous pocketed flatbread is versatile as well as delicious. It can be wrapped around meat and vegetables for a quick but hearty meal or dipped in oil and spreads as part of an appetiser. Pita is baked at high temperatures to ensure its yeast-leavened dough rises and separates. It can also form the base of a pizza, if you fancy yourself some fusion cuisine. Another versatile Greek dish, souvlaki is the common name for small pieces of skewered meat and vegetables that serve as a popular fast food in Greece. It can be eaten off the skewer or wrapped in a pita to complement cheeses, salads, and sauces. Unlike gyros, which consists of rotisserie-cooked meat and vegetables, souvlaki is quick and easy street food – the ideal bite when you’re out and about. Meze – a selection of small dishes – is at the heart of Greek cuisine. The combination of modest plates provides diners with a culinary sampling, making it perfect to enjoy while on holiday. Taramasalata is instantly recognisable from its rose-pink hue of salted and cured fish roe mixed with olive oil, lemon juice and either bread or potatoes. It can be further dressed up with herbs and spices to give each version a unique flavour. 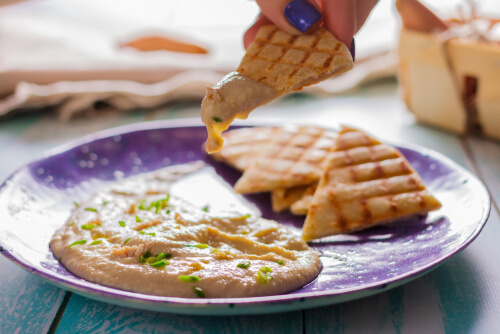 Ideal for dipping and sharing, taramasalata is most commonly paired with pita and olives to whet diners’ appetites for more Greek staples. Another classic dish in Greek meze, tzatziki can also be served alongside meaty entrees to add a cooling flavour and moisture to dry or grilled cuisine. Made from salted, strained yoghurt, tzatziki has a cool, punchy flavour that folds in cucumber, garlic, lemon, olive oil and herbs such as dill, mint and parsley. It’s the perfect accompaniment to add even more flavour to souvlaki, gyro or a hearty Greek salad. Served fresh to order, it can also be enjoyed with warm pita and another slug of olive oil for good measure.